One of the benefits of the recent musical revolution has been the ability to store large amounts of music on small hand-held devices. For example, I have exactly 700 songs on my iPod mini (outdated, but still functioning at top levels), which only requires about two-thirds of the available memory. The idea of carrying 700 songs around was laughable in the recent past, when it would have been on vinyl or magnetic tapes. Now there are commonplace digital media devices that carry upwards of 20,000 songs, all at your fingertips, as they say. Why anyone would need roughly 1,100 hours of music at any one time is a fair question, but the ability is there. This brings up my very favorite iPod feature, which is also available on the majority of digital media players: the ability to create playlists. That may seem like a pedestrian item to label as “my favorite,” but I love being my own DJ, and using my favorite songs to do it. Granted, most iPod users weren’t around way back when DJs were cool (I think I caught the tail end of it in the 80s), but trust me, it was awesome. When I have a modest pool of even 700 songs, I like the ability to pre-select which songs I am going to hear, and then let the shuffle feature surprise me. I mention this because I am about to retire a playlist named “50 Songs V.5” (which is obviously the fifth volume in a series of fifty song playlists). Choosing 50 songs provides three or four hours of music, which is about enough for a typical day of work for me when factoring in pauses and necessary interruptions. I change the songs from time to time and update the version number, meaning V.5 is about to be replaced by a new version. But I am strangely reluctant to let it go, as it’s been my longest lasting list so far. Because this entire blog is a thinly-veiled excuse for me to write about me, I have decided to go through the playlist in question and write something about each song. Although some of my favorite bands are represented, it is not a list of my favorite songs or artists. It is simply a snapshot of what caught my attention one fine afternoon several months ago. I further acknowledge that this article is not likely to be enlightening or educational in any way, although I do hope it is entertaining. I almost can’t believe I’m even bothering to write it. I really, really hate starting out with this one. I considered sorting the list in other ways than alphabetical or removing the parentheses from the title, but I ultimately decided to leave it. If anyone is going to lose respect for my music choices, they may as well right at the beginning and save themselves the reading time. My excuse is that I like pop music. Some artists and songs better than others, of course, but that’s the way it is with any genre of music. Britney may be as crazy as a fluffernutter sandwich now, but when this song was big, she was still the semi-innocent pop singer we all grew to love. It’s a decent song with a nice beat and what sounds like percussion on a cowbell running throughout the verses. So, those who ask for more cowbell can get it here. Not likely to make it onto 50 Songs V.6 though. I never used to like Erasure, and to tell the truth, I still don’t. But, I had a friend who sang the chorus to “A Little Respect” over and over during the few months we were roommates, and I have liked it ever since. The logical thing would have been for me to despise the song after that kind of overexposure, but somehow it worked the other way. I can’t begin to explain why. I cut my musical teeth on groups like The Steve Miller Band. I enjoy most genres of music now, but my first love was Classic Rock. Steve Miller wasn’t exactly revolutionary as a musician, but he wrote some entertaining songs. “Abracadabra” is one of the under-appreciated gems, in my opinion: it didn’t even make his Greatest Hits album. My older brother used to tell a story about going on an elementary school field trip during which this song came on the radio and all the kids on the bus started singing along. I always thought he made the story up – I still do, in fact. This is “Our Song” for my wife and me. I know it’s also “Our Song” for thousands and thousands of couples of the same approximate age, but that doesn’t keep me from being sentimental every time it comes up in the shuffle. I did not discover The Corrs until their fourth album started getting a little playtime on American radio. I have since made up for that oversight by becoming a crazy, over-the-top fan of the Irish siblings. I own every single one of their albums, four of the DVDs (including one that won’t even play on my regionally encoded system), three posters, and I visit as many of the fan websites as I can find. This is a decent song, although not necessarily one of my favorites. I think I put it on my list for a little variety, although any song by The Corrs is fair game with me. No Doubt is a band that I like a lot more than I may care to admit. My wife is the real No Doubt fan of our little two-person family, and she has introduced me to some of their finer work. She always points out how much singing Gwen Stefani manages between breaths at the beginning of this song. It’s really amazing, and worth a listen just for that. Another song by The Corrs, and this is also not one of my very favorites, although it’s a nice little tune. It has a slightly different sound from most of their earlier music, and as such it was an acquired taste for me. “Borrowed Heaven” has kind of a Celtic/African/Reggae Synth Funk sound, which somehow works. I am curious as to why I seem to have only included lesser songs from one of my favorite bands. I’m sure there was a reason. This is one of my favorites on the playlist right now. Michelle Branch is what Britney Spears would sound like if she had musical talent, a good voice, and wrote her own songs. However, Britney is still in the celebrity magazines and Michelle hasn’t been heard from since 2005, so I guess there was a trade-off. This is my favorite song from an under-rated rock band of the late ‘70s and early ‘80s. The lyrics are a bit repetitive (there are only about 23 words that aren’t “I can’t get enough of your love” in the entire thing), but that’s true for lots of songs. The opening verse is one of the most entertaining in the long history of bad rock lyrics: “Well I take whatever I want. And baby, I want you. You give me something I need. Now tell me, I’ve got something for you.” It makes sense, yet it also makes no sense at all. Terribly brilliant. This is the very best song by the Scorpions, although I would entertain counter-arguments: “Rock You Like A Hurricane” also warrants consideration. The intro to this song is classic, and the chorus is an Air-Guitarist’s dream. Any time this song comes on when I am in relative privacy I will sing along with Klaus Meine at the top of my lungs. This list is only a dozen songs long and I have already mentioned three different female pop stars of the late ‘90s/early ‘00s. I wonder what a qualified psychotherapist would make of that. Anyway, this is a borderline-creepy song, featuring then 15-year-old Mandy hissing “give it to me” over-and-over, and lyrics like “satisfyin’ baby, let me show you what I’m made of.” The answer, I presume, is that she is made of candy. I don’t pay very close attention to the rest of lyrics, as I’m afraid I may be guilty of some sort of statutory crime if I do so. I don’t really have a good story or explanation for this song. I am a fan of progressive arena rock, and choosing this for my playlist seemed like a good idea at the time. I generally skip past it lately, and wish the song was “Point of Know Return” instead. I don’t really care for the Dead. I just never got into their music. This song and “Touch of Gray” are about my only exceptions. I did like Teenage Mutant Ninja Turtles when I was a boy, though, so that could explain the appeal of this song. Who doesn’t like Smokey Robinson and the Miracles? The answer is nobody, right? This may be my favorite of their songs, although the music file on my computer/iPod is very quiet, so I have to turn the volume all the way up to hear it properly. Which doesn’t have anything to do with the song itself, but I always enjoy it so much that I forget to adjust the volume back down, meaning the next song is blazingly loud. My personal little joke is to say “Curse you, Smokey Robinson” as I jab at the volume knob; which isn’t really funny, but I get a kick out of it. Those are some good times. In case you can’t tell, I am really enjoying myself. On second thought, please scratch my last comment on the previous song. Irony strikes again. My previously mentioned older brother, who is also a big music fan, claims this is U2’s only decent song. Of course, he doesn’t care for U2, so his opinions should be adjusted accordingly. It is one of their best, though. This is one of CCR’s best songs, although I rarely listen to it due to overexposure in my younger days. I am a big Creedence fan, although I just listen to different songs. It seems to me I put this on the playlist for old-times’ sake, but I still usually skip past it. That was an odd decision on my part. Jeez, Nate, will you stop with the teenage girl singers, already? I’m a bit shocked and embarrassed, and it’s my own list. I think this one is defensible, though, because it’s a great song. I have heard the original by the White Stripes, and though I usually downgrade remakes a notch or two, this one is better. Jeez, Nate, will you stop with the Canadian power trios, already? Rush has been around for several decades, and this was one of their first big songs. That means it was written back when Neil Peart only had sixteen or seventeen drums in his kit (Rush joke). Interesting tidbit: Rush was elected into the Canadian Music Hall of Fame in 1994, one year after Anne Murray and one year before Buffy Sainte-Marie. I’m not trying to make fun of the CMHOF by writing that; I’m just trying to make the point that, you know, Canada rocks. I don’t often listen to The Cure, because generally I am a bit too happy to do so. I like this song, though, which has kind of a bright and fun tune. 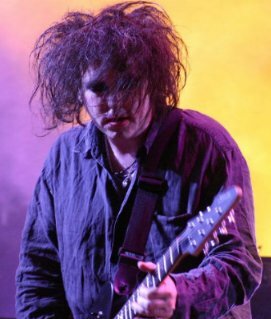 Startling news of the day: I just read on Wikipedia that the first incarnation of the band that would become The Cure formed in 1972! I guess that stuff about vampires being long-lived really is true. I have been a fan of The Doors for years, but I had never really listened to this particular song until a few weeks ago. The song was released in 1978, seven years after Jim Morrison’s alleged death, and is comprised of Morrison’s bizarre spoken word lyrics over a funky early disco beat. It’s every bit as jarring as it sounds – the lyrics are completely insane. The beat is nice, though, so it’s half of a decent song. This is apparently enough for me to include it on my playlist. I once listened to this song for eight straight hours, just to see if I could. I’m not sure if that qualifies as bragging, but it was an unforgettable morning and afternoon. The funny part is that I am not really a fan of The Smiths. I am not making any of this up, by the way, even if it sounds like it from time to time. The interesting thing about this song is that it actually has lyrics. For most of my life I was under the impression that Marvin was singing: “Ah usagowadda podaay, uhstadaaa. Cuzawaa tuhnaavaa, tuhrelluh geddan. Bumabadaa, turr, nee, fee” at the start of the song. I didn’t know what any of it meant, but it was Mr. Marvin Gaye behind the mic, so I figured it probably had something to do with making sweet love. After reading the lyrics the actual words were easy to pick out, and as it turns out I was correct. That guy just liked to sing about making sweet love. Ah, AC/DC… the masters of Rock and Roll subtlety. This joins their pantheon of such great titles as: “Let’s Get it Up,” “Beating Around the Bush,” and “I Have Enormous Gonads.” I slightly altered one of those titles, but the casual observer probably wouldn’t even notice. Joss Stone should definitely make it to V.6 – she has an awesome voice and meaningful lyrics too. Other than that, the list really shows that musical selection still is dominated by the time you grow up in. Even though the genres are basically the same with what I would have ended up selecting, the artists are totally different. Good post though, always interesting to see what friends listen too. You might wanna try Last.fm too. Well done, Lad. I enjoy the bit about Canadia, Eh! Being from Canadia…well you know the rest. I did NOT make up the story about “Abracadabra”, in fact it remains a seminal memory from my childhood. We were on the way to the “This Is The Place” monument, pre-renovation that almost took our father’s life to be exact. I also believe that my exact words about “Desire” were “This is the only U2 song that doesn’t SUUUUCCCCKKK”, but what you said is close enough. Good list, although I was surprised that you went for the Smokey Robinson version of “Cruisin'” instead of Huey Lewis and Gwyneth Paltrow’s version. Must have been a gut-feeling decision. When I was dating my now-wife, and turned on my Marvin Gaye CD only to have her belt out “Got To Give It Up” word-for-word, I knew that I had found my one true love. Only later did I find out that she knew it because it was on the “Practical Magic” Soundtrack.